Where do you stand in the current pie v. cake debate? I have been noticing that there is a raging controversy regarding the respective merits of each iconic dessert category. Risking the accusation of being wishy-washy, I refuse to opt for one over the other. I embrace cake for its chocolate, vanilla, mocha, caramel, and similar incarnations (though citrus and other fruit work well in cakes, too). Pie highlights fresh fruit better, one can argue, yet there are exceptions, e.g., chocolate cream, butterscotch, chess, and custard pies. In the summer, I tend towards pies and their fruit-based cousins, the grunts, slumps, cobblers, crisps, crumbles, pan dowdies, betties, tartes, and gratins (the last two hailing from the French side of the family). But I will use berries I have picked and frozen for pies and their relatives during the winter. I have been known to bake a cake or two in the summer for a special occasion. So a seasonal delineation does not work for the pie v. cake battle in my kitchen, either. I have always liked the idea of cherry pie, often much more than its reality. As a child, I ordered it for its redness (my favourite colour) but, since then, I avoid it generally. If I think there is any chance of a gloppy, gummy, artificially coloured, pre-made red filling, I will opt for another dessert. This is the sad state of cherry pie-dom in North American restaurants and bakeries, I hate to admit. Pie should be a revelation, not a disappointment. 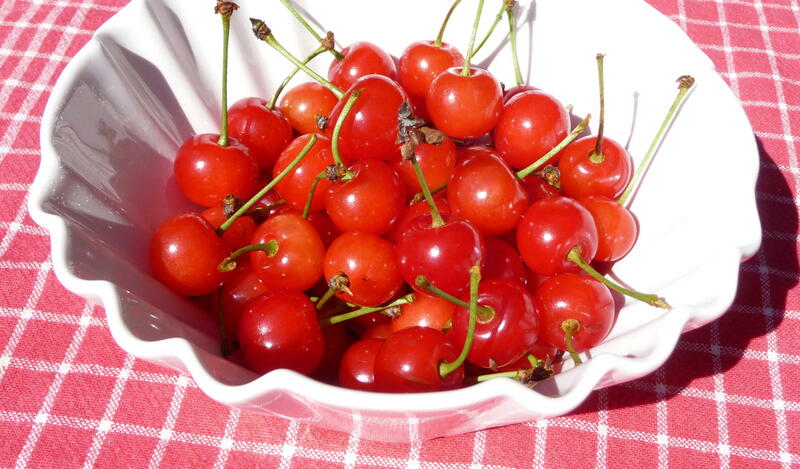 At our Saturday market last, I noticed a basket of gleaming sour cherries: they were so bright and red and perfect that, on first glance, I thought they were the season’s first cherry tomatoes. 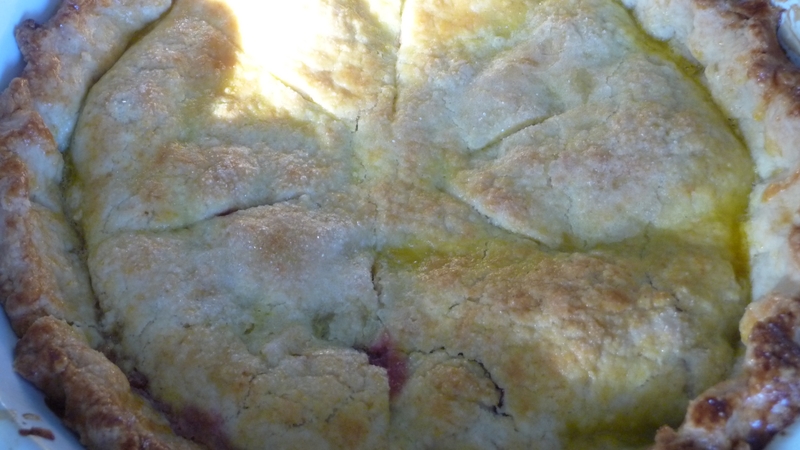 I had not known that our island had any of the sour cherries I had been fantasizing about lately, so I could bake a classic cherry pie. So having purchased one punnit (or, basket, but I love this technical term), I decided to make a sour cherry pie. Later, I regretted not having bought more. I needed far more than the eight ounces I had for even the most modest of pie filling recipes – beyond individual tarts, with which I did not want to fuss: it is summer, after all. I augmented the sour cherries with four ounces of sweet Lapin cherries I had on hand, from the Okanagan (fruit basket of British Columbia, since you asked). Then I decided on a top-crust only British-style pie I found in A Baker’s Tour, from baking guru, Nick Malgieri. The juicy red filling I adapted from food-blogger-celebrity-diva, Deb Perelman, of Smitten Kitchen. If you have a food processor, this recipe is super-fast; if not, it will take just a bit longer, using a pastry blender or a large for to make the crust. 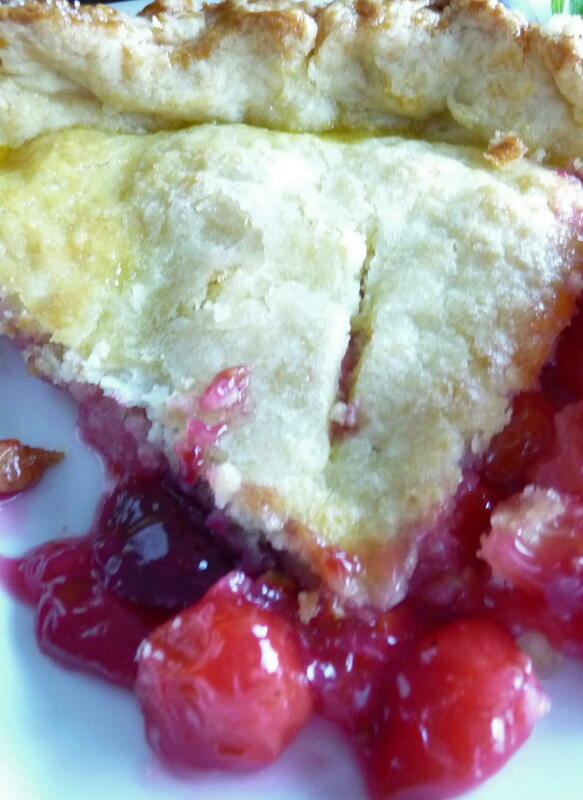 The traditional cherry pie challenge is to either blind bake the crust (i.e., without the filling first) and/or find a filling which will not result in a soggy bottom – after all, who wants a soggy bottom?? This recipe obviates the whole bottom crust issue. This version also takes less time to bake, as there is no pre-baking (blind baking) for a bottom crust. The filling turned out to be the cherry filling of my fantasies, with the bright red of the sour cherries contrasting the deep purple of the Lapins, and a perfect balance of sweet and sour. The crust was a thick blanket of flaky, tender pastry. This version also is good for people who fear making pie dough, as it just requires one disk to be rolled out and placed right on top of the cherries – no need for exactness in fitting into a pie plate. Maybe the British are on to something? So for a fast and fun marriage of sweet and sour cherries, this is a recipe which will serve you well and serve up a great summertime pie. Late-evening sun dapples the just-baked cherry pie. For the pastry dough, combine the dry ingredients in the bowl of a food process fitted with the metal blade. Pulse several times to mix. Add the butter and pulse 4 or 5 times, or until the butter is in pea-sized pieces. Add the cream and pulse 2 or 3 times, but do not allow the dough to form a ball. Invert the dough to a floured work surface and carefully remove the blade. Gently squeeze and press the dough together and form it into an oval disc. Chill the dough in plastic wrap for an hour or so before preparing the filling. In a large bowl, mix the cherries with the sugar, cornstarch and sea salt. Taste the mixture to see if you want more sugar than is called for. Place rack in lower-middle position of oven. Remove dough from refrigerator and place on floured work surface. Flour the dough and press it with a rolling pin in gentle parallel strokes to soften it a bit. Roll dough to a more-or-less even 10” round disc. Lift with a cake lifter (if you have one) or gently loosen with a bench scraper. The dough also can be rolled loosely/draped onto the rolling pin, then unrolled, and placed onto the cherry filling. Seal the edges by crimping between the thumb of one hand and the opposite fingers of the opposite hand to form an edge against the sides of the pie dish. Make six two-inch long slits, radiating from near the centre of the pie to allow steam to escape and provide a professional-looking crust (more or less). Brush the crust with the egg wash and sprinkle with either granulated or sanding sugar for that sparkly look! Bake for 30-35 minutes, until the crust is golden-brown. Serve warm or at room temperature, with or without, ice cream or whipping cream. Enjoy your summertime cherry pie fantasy. 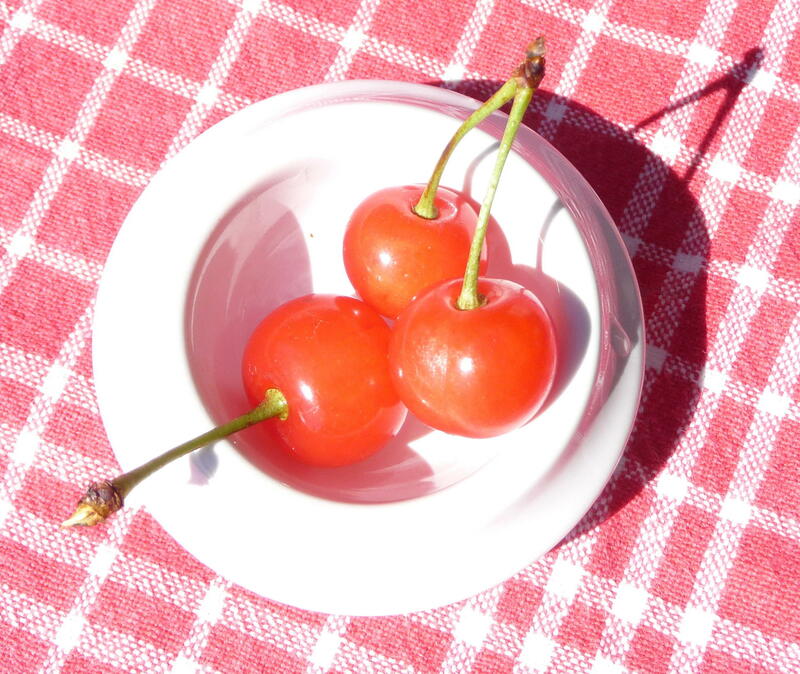 This entry was posted in Baking, Blogs and Food Writing, Dessert, Pie, Recipes Misc and tagged Baking, Blogs, Pie, pie v cake debate, Recipe, sour cherries, summer, sweet cherries. Bookmark the permalink. Punnit – did not know that technical term. Still don’t know what a slump or a grunt is…not within the food arena at least. I also thought the sour cherries were perfect little cherry tomatoes, almost bought them. I agree with you about pie vs cake. Could not possibly choose. Your pie looks so good. Thanks, Kip. See what you learn by dropping in? I do love a buttery crust. I’ve been lazy as late and have been making a galette instead of pies with the new berries. Still got a flaky crust and fresh berries. Life is good! Great minds think alike. I love cherry pie and have made many pies with top crust only just because I love the flaky goodness and that it doesn’t sog like bottom crusts… when you do both you have so much butter!! It works for pretty much everything. 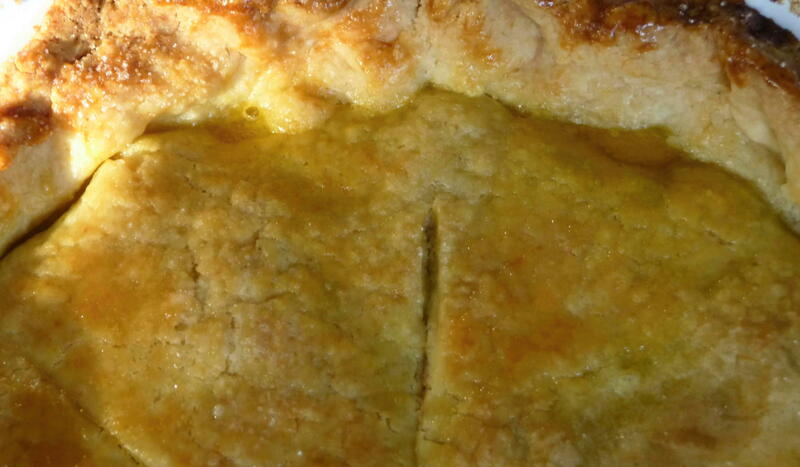 Love the cream addition to the crust… another British speciality is the hot water crust… and it works!!! Thanks for the fun post! I’m so glad you were able to find sour cherries locally; that must’ve been an exciting moment at the market! I have two pounds of pitted sour cherries in my freezer right now, waiting for the right pie opportunity. And I must say, your version looks positively lip-smacking. Ever since you told me about this recipe I’ve been waiting for it! Trust me to be totally AWOL the weekend you post it… I always think of fruit pies as an inherently American/Canadian/non-British thing (“ya want some more cwoffee with yer pie, sugah?”), and meat pies as more of a British/Ozzy/Kiwi thing (I have no quote for this to back up my statement, er: “I am a massive fatty, that’s why”?). Maybe I should’ve eaten less Melton Mowbray pork pies as a kid and more cherry pies… clearly I’ve grown up on the wrong continent. Jax. thanks for being you – and so sweet! I agree, more or less, about your dichotomy of Brit-Kiwi-Ozzie meat pie v. sweet N. American. You should see the movie, “Waitress”, if you haven’t, for more on pies (here’s the recipe for “I-Don’t-Want-Earl’s-Baby Pie”: http://dinnerwithjulie.com/?s=waitress), which is more quiche-like and therefore, French, but are we talkin’ French cuisine and tartes now?? Top/bottom-crust debates aside, you must bake some pies now! Or else, you can wait until fall, or as you’d say, “autumn” for apple, pear, etc. Sour cherry pied sounded so good when I first read it this weekend that I searched around San Diego to see if anyone had a fresh, homemade sounding one that looked even half as good as the one on your post! I normally would say I am in the cake “camp”, and I just posted a Chocolate Malt Cake, but lately pies have been getting me happy in the kitchen! Thanks, Geni. It is kind of you to write such thoughtful things. I made Nigella Lawson’s chocolate malt cake a few years ago but am not sure if it is the same as yours, which looks great!